Control Solutions’ BAS-700 i.CanDoIt® Web Enabled I/O Programmable Controller is a modular system that lets you build your own custom point count. Mix and match analog and discrete, inputs and outputs. Simple logic and alarm monitoring is already built in. You can further customize control applications with programming in Script Basic. All local registers are accessible to Script Basic programs. The BAS-700 can also be used as a Modbus TCP slave I/O device or for SNMP input/output. Access I/O points as Modbus holding registers. Read and write inputs and outputs using SNMP Get and Set. Pricing and Buy Online provided module by module upon expanding the applicable sections below. Control Solutions created the BAS-700 building block approach to let you create your own Modbus or SNMP I/O node. You simply plug together the modules you need! Packaging is simple and economical with cut-to-size snap track. Creating a custom system is easy and economical with the BAS-700 series. Configuration is done via the web pages. Configuration is saved in the internal Flash file system, and may be exported for backup or for duplicating the configuration in another device. Click on the link below to view a demo copy of the entire Web UI in the BAS-700. • Templates for threshold & response "rules"
The BAS-7050 processor module features a high powered RISC processor with Ethernet network capability. This brings the entire series of BAS-700 I/O modules to Ethernet and the Internet. 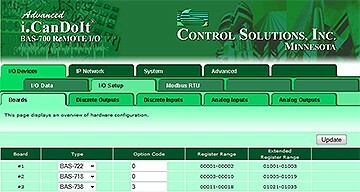 You can mix and match a variety of point counts and types for your own custom Ethernet I/O node. Support is available for SNMP, HTTP, FTP, email, and other Internet applications, plus network support including DNS, DHCP and BOOTP. Control Solutions provides an SNMP agent, and both client and server capability for Modbus/TCP access to BAS-700 series I/O modules. Whether you need Modbus I/O or SNMP I/O, the BAS-700 series is your answer for configurable Ethernet I/O nodes. The BAS-7050 now comes with i.CanDoIt®, adding a web interface for configuration and monitoring. The enhanced real time option adds data logging, scheduling, email alerts and data log delivery, and dynamic DNS support. Simple programming can be done through rule templates. The BAS-7050 is freely programmable using the built-in Script BASIC compiler/interpreter. The BAS-710 series of Discrete Input modules are configurable for high or low ranges of AC or DC voltages. Your BAS-700 series system can be expanded in increments of 4 or 8 discrete input points using these modules. Inputs are individually optically isolated. The BAS-7124 is the highest density input board in the BAS-710 series, with 24 inputs per module. These inputs are restricted to sensing only contact closure to ground using excitation provided by the BAS-7124. The intended application for this module is sensing contact closures for alarm systems. The BAS-714/400 Discrete Input Module extends the range of discrete inputs to 400 volts peak (400VDC, 277VAC). The BAS-714/400 is designed to sense on/off conditions in commercial lighting or other higher voltage applications. Inputs are optically isolated. The BAS-720 series of Discrete Output modules are designed to handle a wide range of requirements, including AC and DC loads, both high and low voltages, and even lighting system requirements with the 277V ballast rating of the relays used. Relays and plug-in terminal blocks are rated at 12A. NO and NC both provided. The BAS-728 is designed to provide higher density discrete outputs, and adds the feature of socketed fuses on-board. The common terminal of the relay contains the fuse, thus both Normally Open and Normally Closed contacts are protected. The BAS-728/F provides the highest density output module in the BAS-720 series. This module is useful for interfacing to contact inputs of other equipment, or for driving pilot relays or indicators. Each FET is ESD protected, and includes an internal diode protecting it from inductive loads. The BAS-730 series of Analog Input modules are configurable to accommodate 0-10VDC, 4-20mA or 10K Thermistor inputs, with each channel individually configurable. The BAS-738/3 is useful for measurements where common floats at some voltage other than ground. The BAS-738/3 has socketed range resistors and provides isolated inputs (isolated channels to system, non-isolated channel to channel). The BAS-738/3 is useful where common floats at some level other than system ground, and can be used to take measurements in -48VDC telecom applications. The BAS-742 Analog Output module is designed to provide the common 0-10VDC or 4-20mA output levels for process control. The output types are individually configurable per channel. • 4-20mA output drives 250 load max. Snap track is a commonly used method of mounting circuit boards inside control panels. 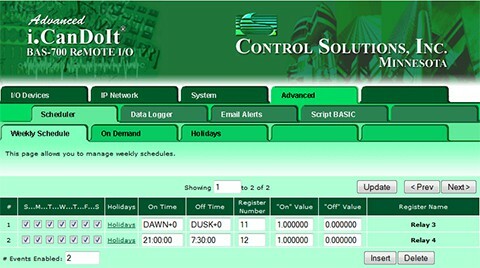 This method is most commonly found in building automation and facility management. Because it can be cut to any length needed, it is especially suited to the BAS-700 series with its endless possibilities for configuration variations. Snap track comes in standard 4 foot lengths. Control Solutions also stocks 2 foot and 1 foot lengths, and will custom cut (down from 48 inches) to any desired length. The rack mount option for the BAS-700 series provides room for a smaller system, occupying less space. A power-on indicator is included on the front panel. (Circuit boards excluded.) The rack kit is intended for prototype use. If you are interested in a production design, please contact sales@csimn.com to discuss design details for a quote. Snap track is sold as a convenience to Control Solutions customers who are purchasing BAS-700 series boards with the track. If you are looking for snap track alone for your own applications not related to BAS-700, you may purchase it directly at www.beyondcomponents.com. Zip file contains spreadsheet that simplifies calculation of scale factors for analog I/O.